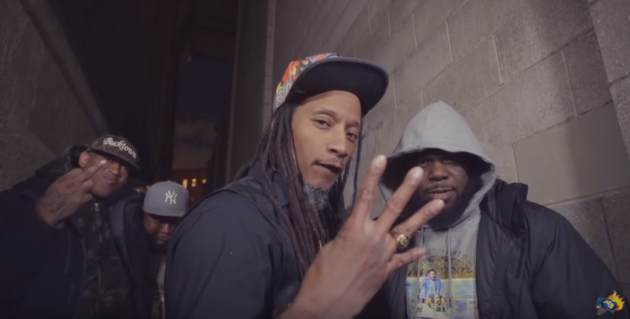 Tek & Steele are Brooklyn duo Smif-N-Wessun, presenting the music video for “Testify”, the new single from The All, their new album produced entirely by 9th Wonder and the Soul Council. The video was directed by Colton Chapman and James Niche, and the track was produced by Khrysis. Smif-N-Wessun crashed the hip-hop scene in the 1990s with their debut album Dah Shinin’ (named a Top 100 Album Of All Time by The Source and a Top 50 Debut Album Of All Time by Complex), and made a lasting mark on hip-hop alongside the other members of their Boot Camp Clik (Black Moon, Heltah Skeltah & O.G.C.). Their 2011 album Monumental was produced by Pete Rock, and their last release was their 2012 EP Born And Raised. North Carolina producer 9th Wonder came to fame as beatsmith for Little Brother and went on to produce for Jay-Z, J. Cole, Kendrick Lamar and many more. Steele describes the new single as “a realistic reflective look back on our accomplishments and failures throughout our career and serves as a precursor to what you will experience on The All.” The All is scheduled for a February 22, 2019 release on Bucktown USA, the multi-media company General Steele created in 2004 alongside partner Cynical Smith, with digital distribution through Duck Down Records.